If it walks like a dodo bird and talks like a dodo bird, don't call it one because it probably isn't. They've been extinct for over 350 years. As conservationists and geneticists toss around the idea of re-creating extinct species, there are some practical concerns to address before any are introduced. For instance, what to call the new animals. A paper published Friday in Science argues that de-extinct animals should have the suffix "recr" from the Latin recrearis, meaning revived, added to their scientific name. 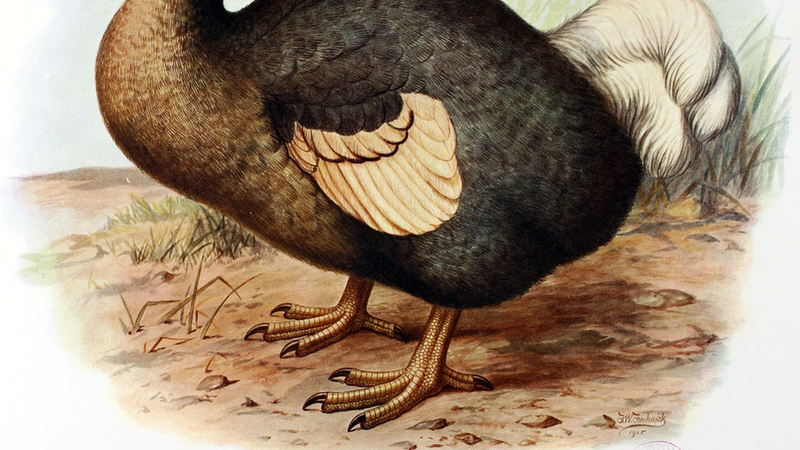 If we brought back the dodo, the flightless bird would get a new name: Raphus cucullatus recr. Why this matters: Names are used to identify endangered populations, and can determine where conservation dollars are spent. The difference: No matter how good a cloning technique is, these engineered animals will likely never fully replace their extinct cousins. Not only will the microbes in the animals be different, their mitochondrial DNA, which animals get from their mothers, will come from whichever species donated the egg. "Any recreated extinct species will contain some genes from a living one," Axel Hochkirk, one of the authors of the paper, tells Axios. It's sort of like Jurassic Park, where the de-extinct dinosaurs have DNA from living frogs, but with more realistic science and less disastrous consequences. And dinosaurs probably won't be returning, or mammoths. Hochkirk thinks smaller, less charismatic animals like insects might make easier targets. An example: The Heck cattle was bred in the 1920s to resemble their extinct ancestor, the aurochs. Creatures like Heck cattle can take over an extinct animal's role in the ecosystem, but they will be genetically different from that species. It might also be possible to bring back extinct species with cloning or genetic engineering. Other problems: Giving de-extinct animals a separate name could help determine who is held liable if they cause damages. Farmers have environmental liability insurance if their crops are destroyed by wild animals, but it's unclear who would be responsible if a de-extinct species ruined a field: the people who genetically engineered it and patented its genes, the people who released it, or none of the above. Not so fast: Hochkirk, an entomologist at Trier University in Germany, tells Axios that it'll be a little while before it's time to decide what to call these new species. Attempts to recreate extinct species via cloning have yielded promising, but so far unsuccessful results. Once humans succeed in re-engineering these animals, they'll probably spend decades in zoos before they're ever introduced into the wild.